Uranium is a naturally occurring radionuclide found in granite and other mineral deposits. In its natural state, it consists of three isotopes (U-234, U-235 and U-238). On an average, 1% - 2% of ingested uranium is absorbed in the gastrointestinal tract in adults. The absorbed uranium rapidly enters the bloodstream and forms a diffusible ionic uranyl hydrogen carbonate complex (UO2HCO3+) which is in equilibrium with a nondiffusible uranyl albumin complex. In the skeleton, the uranyl ion replaces calcium in the hydroxyapatite complex of the bone crystal. 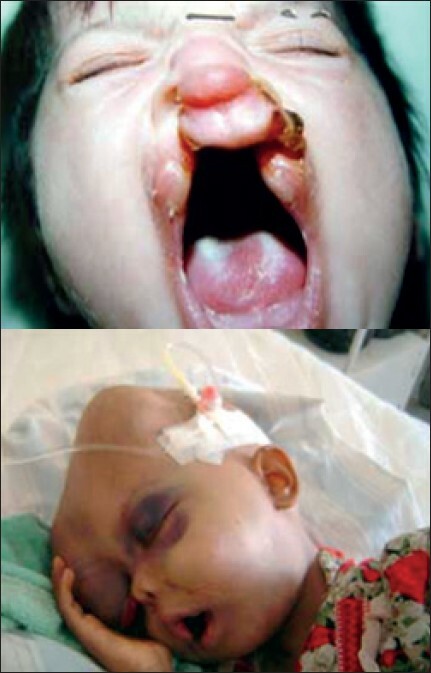 Although in North India, there is a risk of radiological toxicity from orally ingested natural uranium, the principal health effects are chemical toxicity. The skeleton and kidney are the primary sites of uranium accumulation. Acute high dose of uranyl nitrate delays tooth eruption, and mandibular growth and development, probably due to its effect on target cells. Based on all previous research and recommendations, the role of a dentist is to educate the masses about the adverse effects of uranium on the overall as well as the dental health. The authors recommended that apart from the discontinuation of the addition of uranium to porcelain, the Public community water supplies must also comply with the Environmental Protection Agency (EPA) standards of uranium levels being not more than 30 ppb (parts per billion). Early childhood dental caries occurs in all racial and socioeconomic groups; however, it tends to be more prevalent in children in families belonging to the low-income group, where it is seen in epidemic proportions. Dental caries results from an overgrowth of specific organisms that are a part of normally occurring human flora. Human dental flora is site specific, and an infant is not colonized until the eruption of the primary dentition at approximately 6 to 30 months of age. The most likely source of inoculation of an infant's dental flora is the mother, or another intimate care provider, shared utensils, etc. Decreasing the level of cariogenic organisms in the mother's dental flora at the time of colonization can significantly impact the child's redisposition to caries. 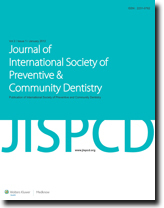 To prevent caries in children, high-risk individuals must be identified at an early age (preferably high-risk mothers during prenatal care), and aggressive strategies should be adopted, including anticipatory guidance, behavior modifications (oral hygiene and feeding practices), and establishment of a dental home by 1 year of age for children deemed at risk. Background: Recently, the Indian government introduced pictorial warnings that occupy an important position among different tobacco control initiatives. A study was done to evaluate the opinion of tobacco consumers on the implementation of pictorial warnings on tobacco packs and to compare the effectiveness of these warnings among individuals of varying socioeconomic status. Materials and Methods: This was a hospital-based study carried out among the tobacco-using patients attending the Outpatient Department of Sri Sai College of Dental Surgery, Vikarabad, Andhra Pradesh. The number of participants in the survey was 111. Questionnaire method was used for collecting the data. Results: Among the 111 participants, maximum number of study participants using any form of tobacco products were in the age group of 15-24 years, and higher consumption was seen among the lower socioeconomic strata. 88.3% of the participants strongly agreed on strengthening the warnings while 73.2% of them felt that pictures on tobacco packs should occupy 100% of the display area to make them more effective. Conclusion: These results suggest that policy makers should not be reluctant to introduce stronger and vivid pictures. Objectives: This study compared the intraoral distribution of 0.1% chlorhexidine with alcohol (CHX+Alc) and 0.2% chlorhexidine without alcohol (CHX-Alc) with shorter rinsing times (10s,20s,30s) following a 72h non brushing period. Materials and Methods: This study was designed as a single blind, randomized two group parallel experiment with a total of 30(15male,15 female) dental students. To disclose the plaque, erythrosine-containing disclosing agent was added to both the mouthrinses. Group I (0.1% CHX+Alc) & Group II (0.2% CHX-Alc) were asked to rinse with respective mouthrinse for cumulative periods of 10,20 and 30s, following which plaque was scored. Results: In Group I, comparison between 10&20, 10&30s was statistically significant but no significance was observed between 20&30s, whereas in Group II, comparison between all the time points were statistically significant. On comparison of plaque scores, plaque scores of both the groups at 10 & 30s sec, show no statistical significance but at 20 seconds was significant (P<0.001).The mean plaque scores of lingual surfaces were lesser in group II whereas in group I lingual surfaces recorded more plaque than the vestibular surfaces. Conclusions: Within the limitations of this study, it can be concluded that rinsing for 30 seconds with 0.2% CHX-Alc (Rexidin) is enough for intraoral spread of the mouthrinse whereas rinsing with 0.1% CHX+Alc(Eludril) for achieves the same in 20 seconds, for effective plaque inhibition, both of which will have a positive influence on patient compliance. Background: World Health Organization (WHO) predicts that tobacco deaths in India may exceed 1.5 million annually by 2020. Objectives: The aim of this study was to estimate the prevalence of tobacco use, its influences, triggers, and associated oral lesions among the patients of Rural Dental College and Hospital of Loni, Maharashtra. Materials and Methods: A hospital based cross-sectional study was conducted from June - December 2010. All the patients from the outpatient department and with tobacco habits were included in the study. Patients were interviewed through a pre-tested structured questionnaire in relation to their tobacco habits, its influences and triggers. Also clinical examination was carried out to check for any tobacco related oral lesions. For the data analysis, Microsoft Excel and chi-square test was used. Results: The overall prevalence of tobacco use was 16.38%. Smokeless form of tobacco was more prevalent in both males (81.84%) and females (100%). Majority of the patients (males - 68.22%, females- 90.62%) were light tobacco users. About 76.09% males and 31.25% females admitted that they developed the habit due to initial influence of friends. The most common oral mucosal lesion in both the males (42.20%) and females (11.07%) was tobacco hyperkeratosis. Most common trigger for tobacco use was "work related" (69.14%) in males and "after meals" (53.13%) in females. Conclusion: Since the number of tobacco users visiting the dental hospital is reasonably high; dentists can contribute to restrain the hazard through community educational activities such as de-addiction counseling of tobacco users to quit the habit.